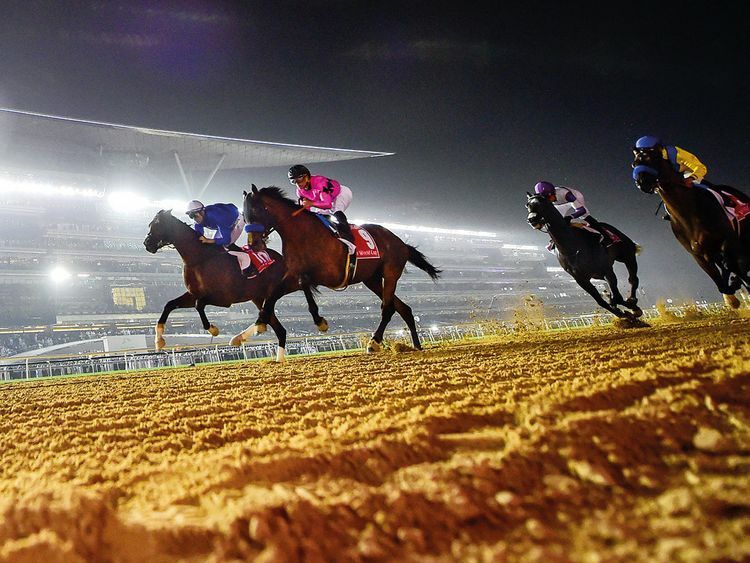 Dubai: I never cease to be amazed at the difference the position on the track and in relation to the horses around them can make to the outcome of a race. The oft-coined phrase ‘beaten by the draw’ is trotted out after many an important race. I used to think “how can a few metres either way matter, especially if they are going in a straight line anyway!” However, experience soon enlightened me and I am sharply aware that the right gate for one may be the wrong spot for the next horse. Some like the hurly burly of the inside of the track, up against the rails and tightened up in the crowd yet thriving on the roughness of it all as they use their power and bullish strength to hold a position, the adrenaline rush of the battle spurring them on, increasing their desire to win. Like humans, horses vary hugely in nature and character. Some are tough and hardy and like us a good many are exactly the opposite. They may be timid and gentle, not quite so brave in a crowd and therefore prefer to be on the outside or the edge of the group with clear daylight around them. Consequently, their confidence can improve and with self-possession comes natural bravery. Hence the vital importance of the best draw for each individual horse in order to enhance the likelihood of them being competitive in a race. An unsuitable draw is often the cause of a race horse subsequently losing its form for a while or even forever. Think back to your children being bullied at school and being reluctant to attend on some days. A similar analogy can be drawn here, in my opinion. Confidence is everything, especially in sport, be it a human or an animal. It is simple to suggest that the shortest way is the quickest way yet we so often see winning horses that have travelled wide throughout the race covering many metres more and yet still won. Consider that perhaps the horse preferred being wide with no interference and less kickback. We all remember Prince Bishop (2015) and Arrogate (2017), who both raced out the back door and completely detached from the field and yet still went on to win. In total contrast was Thunder Snow (2018), who was allowed to dictate the pace throughout on his own terms against the inside rail. This ‘soft’ lead maximised his ability to travel within his comfort zone and quicken up when he needed to. He had conserved petrol most of the race and passed the line in front without so much as a flicker from the fuel gauge. He faces a very different challenge this year and will struggle to get his own way, gate 12 being almost, though not quite in the car park. Horse racing has never been an exact science and we are certain of a thrilling race and Saeed Bin Suroor’s star may yet still eclipse all others.